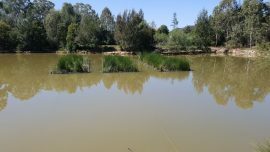 We have previously worked with Blacktown City Council on commissions for two other floating wetlands projects. The first of these is the 440m2 wetlands we installed at Blacktown International Sports Centre in 2014 and the second is the 100m2 installation at the William Lawson Wetland which we completed in 2017. Our third floating wetlands project for Blacktown Council is at Ropes Crossing. The central issue that council wished to remediate was the water quality in a stormwater pond which was clearly being affected by sediment and nutrient runoff from the developing urban catchment. This is a common issue and one that our innovative floating wetlands design is perfectly suited to remedy. 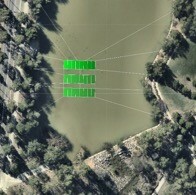 The floating wetland we installed is 168m2 within the 5000m2 pond (as per the map on the right). 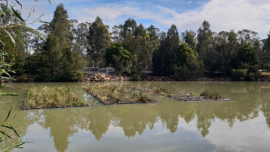 We installed three 56m2 rectangle floating wetlands parallel to one another, positioned to intercept the flow of stormwater flowing through the pond. We did not install our bird protection cage because there are not many waterfowl apart from a few brown ducks. However, we did mitigate the risk of bird predation by installing our pre-planted coir mats, which we planted 18 months ago. 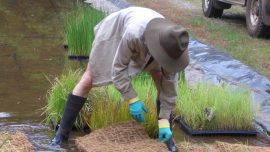 These mats are the ideal way to colonise the floating wetland with the bacteria and microorganisms required to the establish the wetland processes on the constructed floating wetland. We will continue to monitor the site and look forward to our next update which will show the clean water made possible by our floating wetlands.